DUPONT, Washington (CNN) - Two of the three passengers who died when an Amtrak train derailed while traveling along a route for the first time were enthusiastic advocates for travel by trains, the Rail Passengers Association said Tuesday. "Jim was among the country's most respected and effective rail advocates and a good friend and mentor to me. I will miss his counsel, and our community is poorer for his loss," Rail Passengers Association President Jim Mathews said in a statement. "Both Jim and Zack have been advocates of transit and passenger rail for decades, and we can't thank them enough for their work. Our thoughts are with their families at this time." Hamre and Willhoite also were members of All Aboard Washington, a rail advocacy group in their home state. "It was like being inside an exploding bomb," passenger Charlie Heebner told CNN affiliate KOMO. It's not clear why the train was traveling at 80 mph in a 30-mph zone, said National Transportation Safety Board member Bella Dinh-Zarr. "We have recommended PTC for decades," Dinh-Zarr said Tuesday. "Unfortunately the deadline was moved farther into the future, and every year that we wait to implement PTC to its fullest extent means that more people will be killed and injured." Incoming Amtrak CEO Richard Anderson later told reporters that it wasn't immediately apparent whether PTC would have kept the train on the tracks. "It's not clear yet from the NTSB whether PTC would have prevented the accident or not," Anderson said. "We really must wait for the NTSB to give us that information." -- There were two people in the cab in the front locomotive during the crash, Dinh-Zarr told reporters Tuesday afternoon. The engineer was joined by a conductor who was learning the new route, she said. Amtrak's Anderson said that is not unusual. 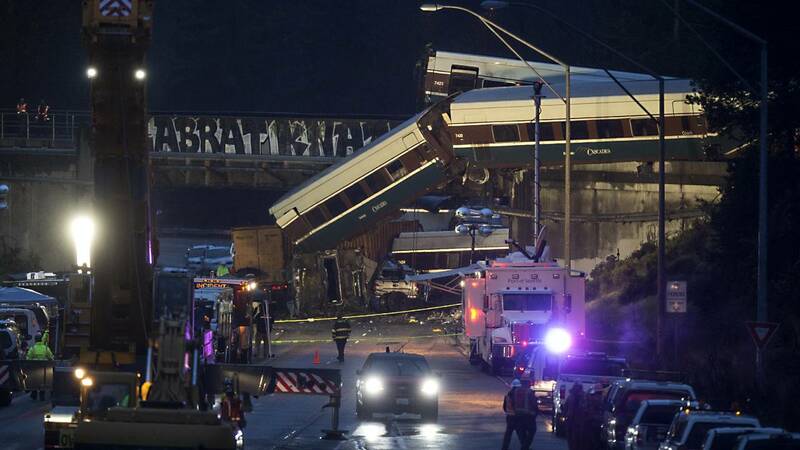 -- The engineer had been on this stretch of track before, NTSB lead accident investigator Ted Turpin said. "Within the previous two weeks he had been qualified to operate on the territory," Turpin said, while adding investigators don't yet know how many hours of previous travel that involved. -- Investigators were able to learn the train's speed from a data recorder retrieved from the rear locomotive. The recorder from the front locomotive was recovered Tuesday, Dinh-Zarr said. Cameras from the train were damaged and have been sent to Washington to see whether video can be retrieved. -- Dinh-Zarr also said that section of the route had a system that cannot enforce speed restrictions on a train, as PTC can. "Sound Transit had centralized traffic control, which is CTC," she said. Sound Transit spokesman Geoff Patrick said earlier that PTC was installed in the segment of tracks where the derailment happened, but wasn't operational yet. Lakewood Mayor Don Anderson had long worried the rail line, which passes through his city, would one day prove dangerous. He's thought so since 2013. He told CNN on Monday night that his immediate concern was for victims and their families in a tragedy "that could've been avoided if better choices had been made." "Our community was concerned about the safety of a high-speed passenger rail line coming through an urbanized area on what had been, for years, essentially an abandoned rail route," Anderson said after the derailment. Lakewood sued Washington's Department of Transportation in 2013, saying, in part, that the passenger rail project had not "undergone sufficient environmental review," according to court documents. The city's suit was dismissed in 2014, court documents show. "His comments focused on the city's concern that there are not enough safety precautions in place to protect pedestrian and vehicle traffic around the railroad crossings in Lakewood," the city's statement says. "This in no way was intended to predict what happened in DuPont, nor was the mayor speaking about the possibility of a train derailment outside city limits." The state Department of Transportation did not immediately respond to CNN's request for comment on Anderson's statements. The biggest obstacle to PTC is cost. Anderson said Tuesday that Amtrak employees are "huge supporters of positive train control. We have all of our capital allocated to get it done." Heebner, who compared the crash to an explosion, said he and his wife, Beverly, had been looking forward to the route's inaugural run. "We knew about this thing. I'd been waiting for it. And we said this is the first run, we're going to ride that first run," Heebner told KOMO. "There was this body lying there," Beverly Heebner said. "I mean he hardly had any clothes on, the clothes had just been ripped off of him. And he was obviously dead."